On Friday August 31st Iranian-born journalist, Shokoofeh Azar was ‘in conversation’ with U3a SurfCoast President, John Bartlett. 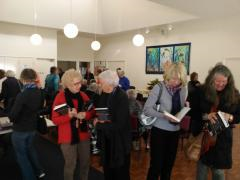 A large number of U3a members and friends heard the story behind Azar’s recent novel ‘The Enlightenment of the Greengage Tree’ which was this year shortlisted for the Stella Prize, Australia’s most prestigious writing prize for women. The book narrates the story of a family caught up in the horror of the 1979 Islamic Revolution in Iran when Azar was just 7 years old. What makes the story unique is that it is written not from the factual point of view of a journalist but in the rich cultural Persian style which combines myth and mysticism to tell a story, which nonetheless is factual. Shokoofeh, who is also a practising artist and lives now in Geelong, told us about her centuries old Persian culture, more akin to Zoroastianism, one of the world’s oldest religions. Azar was herself incarcerated by the regime a number of times before fleeing to Australia in 2011 as a refugee. However, ‘refugee’ is not a title she feels comfortable with. ‘I don’t focus on my background as a refugee’ she says and is now working on her second novel. A gold coin donation from non-U3a members was passed on to the MOTHERS group, a Torquay-based group supporting refugee families in the Geelong region.